In addition to new iPad models, Apple has already this week revealed new iMacs. While iMac Pro was left untouched, both 4K and 5K models of the iMac got some improvements. The first update in two years to regular iMacs comes with improved performance but same design. After such a long time you are rightly expecting a fair bump in computational prowess, and you'd be right. According to Apple, the 21.5 inch 4K iMac improves performance up to 60 percent over its predecessor, while the 27 inch 5K iMac destroys the previous model with 2.4x (240%) the performance. The new 21.5 inch model features a generation old Intel Core processors but the 27 inch 5K iMac at least offers in the highest tier the newer 9th gen Intel Core processors. The CPUs in the new 21.5 inch models are either quad-core or 6-core ones while the 27 inch model offers 6-cores except for the top tier 8-core processor. Both have AMD's Radeon Pro Vega GPUs, and Apple claims that the graphics performance has been improved by 80 percent in the smaller iMacs and 50 percent in the 5K models. The cheapest model has a Radeon Pro 555X, the top 21.5 inch model a Radeon Pro 560X, and the three tiers of 27 inch models have Radeon Pro 570X, Radeon Pro 575X, and Radeon Pro 580X. All new models start at 8 GB 2666MHz DDR4 memory, and feature a Fusion Drive except for the cheapest which has a traditional 1TB hard drive. The prices start at $1,299 (21.5" 6-core:$1,499) for the 21.5 inch model and $1,799 for the 27 inch model. Obviously the prices depend on what additions or upgrade you might make. 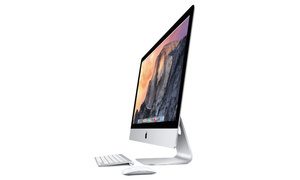 The most expensive new 27 inch iMac costs $5,378.00 without preinstalled software. Apple is also still selling the 2017 21.5 inch model which costs $1,099.